A delegation from Al Falah University visited H.H. 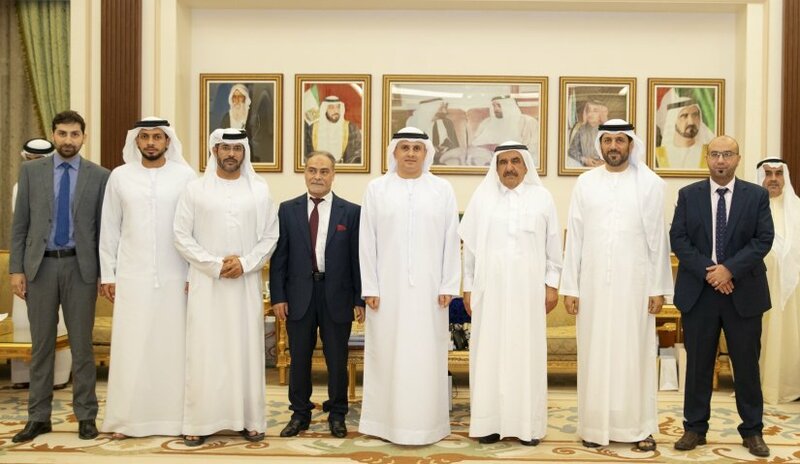 Sheikh Hamdan bin Rashid Al Maktoum, Deputy Ruler of Dubai and the Minister of Finance and Industry of the United Arab Emirates at his palace yesterday in the presence of His Excellency Mirza Al Sayegh, Director of the Office of H. H. Sheikh Hamdan Bin Rashid Al Maktoum. The delegation included Dr. Noor Aldeen Atatreh, AFU Chancellor, Prof. Abdelhafid Belarbi, AFU President and Mr. Mohammed Atatreh, member of the Board of Trustees. The delegation reviewed the activities and programs of the university that meet the needs of the community and the labor market. H.H. Sheikh Hamdan praised the efforts exerted by Al Falah University, the academic and educational programs and the students’ achievements. Dr. Atatreh thanked His Highness Sheikh Hamdan Bin Rashid for his interest to the students and his support for the education process of institutions of higher education in the country and his charitable work which has a great impact in the UAE and the world.